For other uses, see Thesaurus (disambiguation). In general usage, a thesaurus is a reference work that lists words grouped together according to similarity of meaning (containing synonyms and sometimes antonyms), in contrast to a dictionary, which provides definitions for words, and generally lists them in alphabetical order. The main purpose of such reference works for users "to find the word, or words, by which [an] idea may be most fitly and aptly expressed," quoting Peter Mark Roget, author of Roget's Thesaurus. In library science and information science, thesauri have been widely used to specify domain models. Recently, thesauri have been implemented with Simple Knowledge Organization System (SKOS). 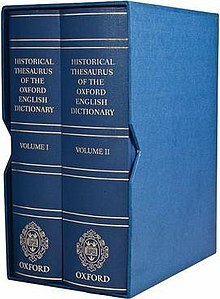 The word "thesaurus" is derived from 16th-century New Latin, in turn from Latin thēsaurus, which is the Latinisation of the Greek θησαυρός (thēsauros), "treasure, treasury, storehouse". The word thēsauros is of uncertain etymology. Douglas Harper derives it from the root of the Greek verb τιθέναι tithenai, "to put, to place." Robert Beekes rejected an Indo-European derivation and suggested a Pre-Greek suffix *-arwo-. From the 16th to the 19th centuries, the term "thesaurus" was applied to any dictionary or encyclopedia, as in the Thesaurus linguae latinae (1532), and the Thesaurus linguae graecae (1572). The meaning "collection of words arranged according to sense" is first attested in 1852 in Roget's title and thesaurer is attested in Middle English for "treasurer". 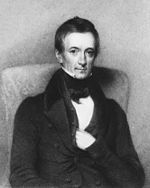 Peter Mark Roget, author of the first thesaurus. In antiquity, Philo of Byblos authored the first text that could now be called a thesaurus. In Sanskrit, the Amarakosha is a thesaurus in verse form, written in the 4th century. The Amarakosha mentions 18 prior works, but they have all been lost. Thesauri have been used to perform automatic word-sense disambiguation and text simplification for machine translation systems. ^ Roget, Peter. 1852. Thesaurus of English Language Words and Phrases. ^ Miles, Alistair; Bechhofer, Sean (2009). "SKOS simple knowledge organization system reference". W3C recommendation. 18: W3C. ^ a b c "thesaurus". Online Etymology Dictionary. ^ R. S. P. Beekes, Etymological Dictionary of Greek, Brill, 2009, p. 548. ^ "Introduction - Oxford Scholarship". oxfordscholarship.com. doi:10.1093/acprof:oso/9780199254729.001.0001/acprof-9780199254729-chapter-1. Retrieved 26 March 2018. ^ Yarowsky, David. "Word-sense disambiguation using statistical models of Roget's categories trained on large corpora." Proceedings of the 14th conference on Computational linguistics-Volume 2. Association for Computational Linguistics, 1992. ^ Siddharthan, Advaith. "An architecture for a text simplification system." Language Engineering Conference, 2002. Proceedings. IEEE, 2002.